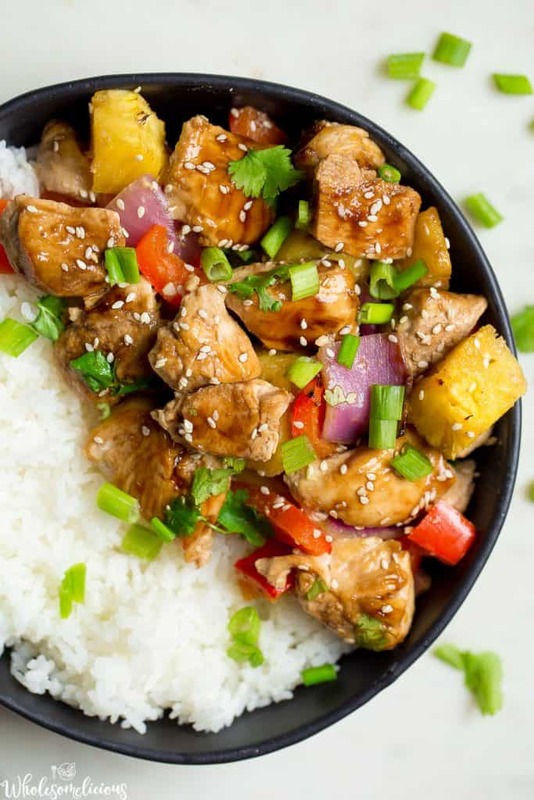 Sheet Pan Teriyaki Chicken with Pineapple is where weeknight, one-pan meal, ease meets scrumptious and healthy dinner! Naturally sweetened, packed with flavor, and full of nutritious ingredients. 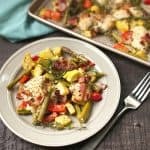 The whole family will love this dinner! 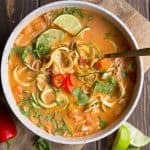 I took to Instagram and my weekly newsletter recently to ask what kinds of recipes you all want for the fall….. The overwhelming response? 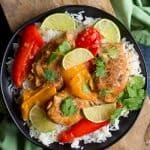 Easy dinners, Instant Pot, few ingredients, and sheet pan recipes. Oh yes, I think we can manage some of those! I like to think my specialty involves giving you all the tastiest dinners, but still have a life and raise a family on top of it. 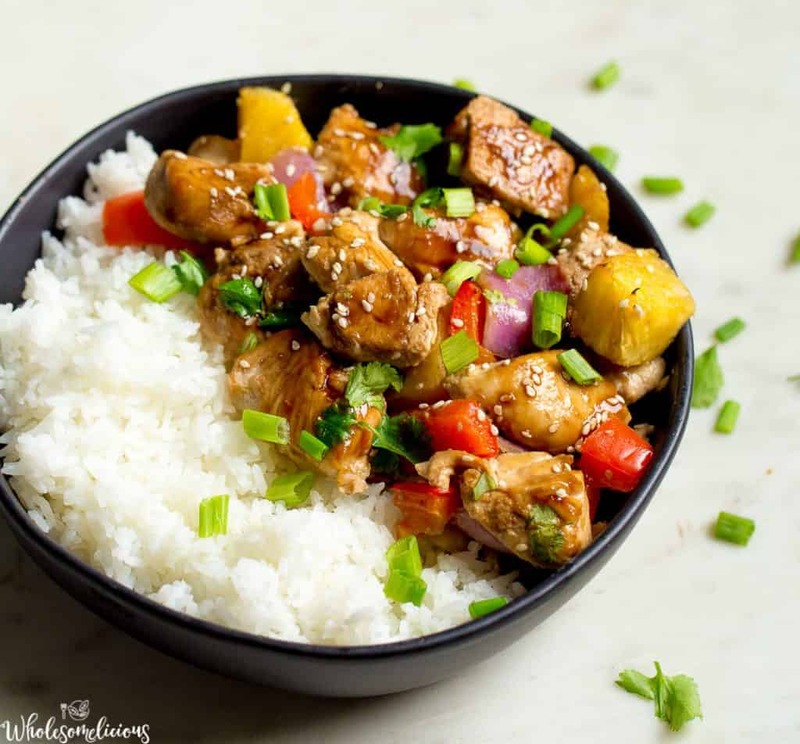 So let’s get started with this simple Sheet Pan Teriyaki Chicken with Pineapple. 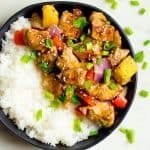 This is one of those recipes were summer pineapple, meets bell pepper, red onion, a simple marinade, and some bite sized chicken for a delicious meal. Topped with some sesame seeds and fresh cilantro. Best part? All made in less than 30 minutes and in one pan! The husband and I have decided that another round of Whole30 is in order. Although travel plans have thwarted our start date, I am already in full blown planning mode. I’m also trying to do as much Whole30 centered dinners as possible to get us ready. I find that it makes things much easier when doing the entire 30 day transition! 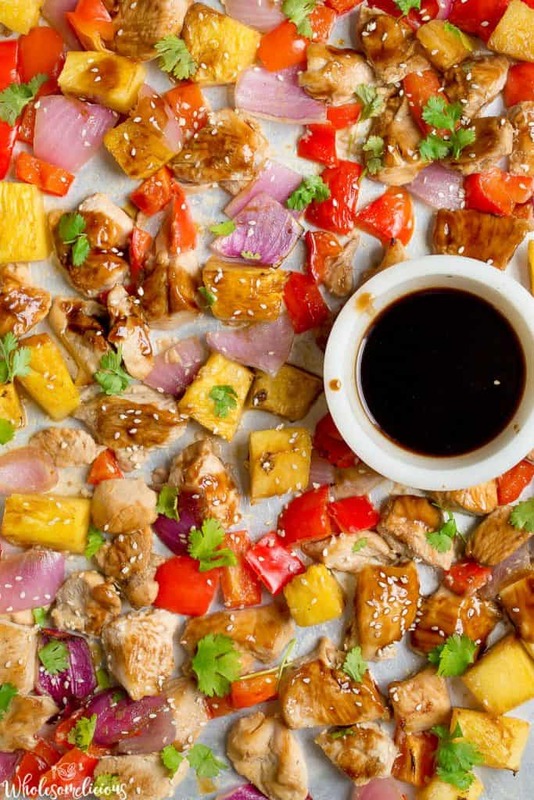 This Sheet Pan Teriyaki Chicken is definitely going to be on repeat! 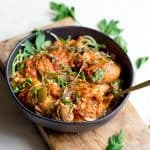 I love the simplicity, flavor, and versatility of all using this dinner for meal prep on weekends to last us throughout the week for lunches or busy weeknights. 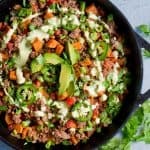 Serve over rice or cauliflower rice, and be sure to top with extra cilantro and green onion! Preheat the oven to 400 degrees. Lightly grease a large baking sheet and set aside. 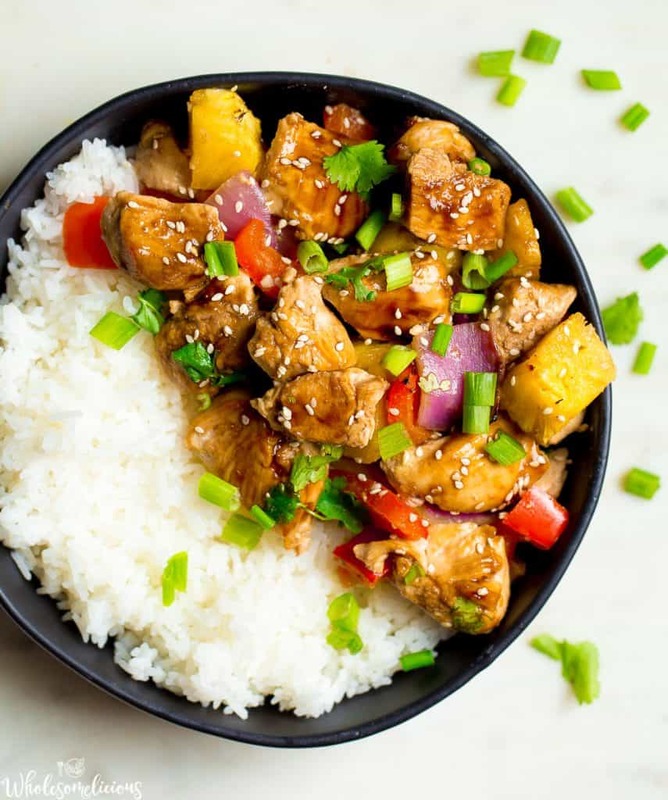 In a small saucepan, heat coconut aminos, pineapple juice, apple cider vinegar, garlic, ginger, and sesame oil over medium heat. In a small bowl, whisk together arrowroot starch and water. Add the mixture to the sauce. Continue to cook until sauce slightly thickens. Reserve a few tablespoons of the sauce for later. 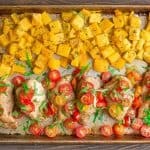 Spread out chicken, pineapple, bell pepper, and red onion over the sheet pan. Pour sauce on top. Place in the oven and bake for 22-24 minutes, or until chicken is cooked through. Remove from oven. Top with cilantro, onion, and toasted sesame seeds. 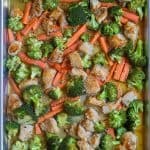 Serve over rice or cauliflower rice. looks great! what is arrowroot starch and can I find it? Can I substitute anything else? Arrowroot is a thickening agent (like cornstarch), and can be found in most grocery stores near the health food section with flour alternatives. You can also use tapioca starch or flour! What’s you recommendation about how to make fresh pineapple juice? I juice a pineapple through my juicer. You can also use a lemon squeezer to juice, or run pineapple pieces through a blender or food processor. Made this last week and omg im still thinking about it!!! So delicious, whipped up in a snap; im obsessed!! Trying out your maple dijon chicken tonight. Thanks for these amazing meals!! !